Developer: DMA Design, Visual Sciences Ltd.
"Grand Theft Auto", developed by DMA Design & published by BMG, arguably spawned the modern genre of sandbox games with its "living breathing city". The player, a petty criminal at the beginning of the game, is presented with immense freedom & a toybox of tools to complete a series of missions given to him by local mafia gangs. 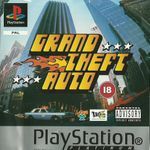 Played from a top down perspective, the player can steal cars, mug pedestrians and generally cause chaos throughout a city. The city reacts to the player's actions; fires cause fire engines to reacts, ambulances come out to pick up the dead & injured, committing crimes causes the police to chase after the player. Broken into three chapters, each inspired by American cities, the player has a score-based challenge to reach to complete each level. Players can earn points by committing crimes, completing the story missions, or by completing various side-missions (e.g. stealing different types of cars, completing rampage missions etc). GTA was notably a critical & commercial success in Europe but a flop in North America. In North America, its top down perspective & sprite-based graphics were viewed as old-fashioned.